More than thirty years after the world stared down what Kennedy Administration officials described as "the gun barrel of nuclear war," we are still learning the secrets of the Cuban Missile Crisis. The National Security Archive's ground-breaking research and documentation of this near-nuclear confrontation is reflected in this book which combines formerly top secret presidential, Pentagon, and CIA documents, with contextual overviews, a comprehensive chronology of events, and biographies of the key U.S., Soviet, and Cuban players. The result is a document-by-document account of the most important superpower confrontation of the twentieth century. This collections of documents, which includes the recently declassified letters between John Kennedy and Nikita Khrushchev, minutes of executive committee meetings during the crisis, and CIA planning papers to overthrow Fidel Castro, provides the reader with a unique fly-on-the-wall view of the decision-making process and operations that brought the world to the brink of self-destruction. "The work of Chang and Kornbluh and their colleagues at the National Security Archive has helped to revolutionize not merely our conception of the event--which now appears more complex and dangerous than before--but also our conception of how to conduct rigorous, responsible inquiry into our recent history," writes James Blight, the nation's best known scholar on the missile crisis. 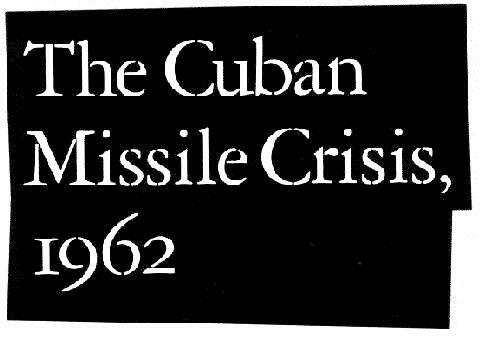 The Cuban Missile Crisis, 1962, according to the Stanford Journal of International Affairs, "is a collection which students of the crisis, scholars of international relations, and even interested laymen should find fascinating and invaluable."